Washington Research Council publishes a new comparative analysis of Washington taxes. A useful, timely policy guide. 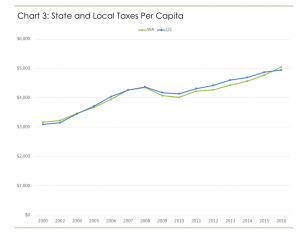 Despite its lack of an income tax, Washington’s state and local taxes per capita have largely tracked the national average (see Chart 3 on page 2). In 2016 (the most recent data available), Washington’s state and local taxes per capita were $5,050, above the national average of $4,946. By this measure, Washington ranked 17th in the nation. Here’s the chart mentioned above. The Council also cites a Pew research report finding Washington’s tax system is the 14th least volatile in the nation and notes that the increase in the state property tax levy will add to the system’s stability. As we’ve reported, state revenue growth has been strong in recent years. The WRC brief provides additional context. Washington’s recent revenue growth has been strong by national standards. Indeed, Washington’s state and local tax growth from 2015 to 2016 was the nation’s highest. Yet, the WRC includes a warning. …Legislators should not expect that recent exceptional revenue growth will continue forever and should plan accordingly. Good advice. And a good – and timely – overview of the state tax structure.